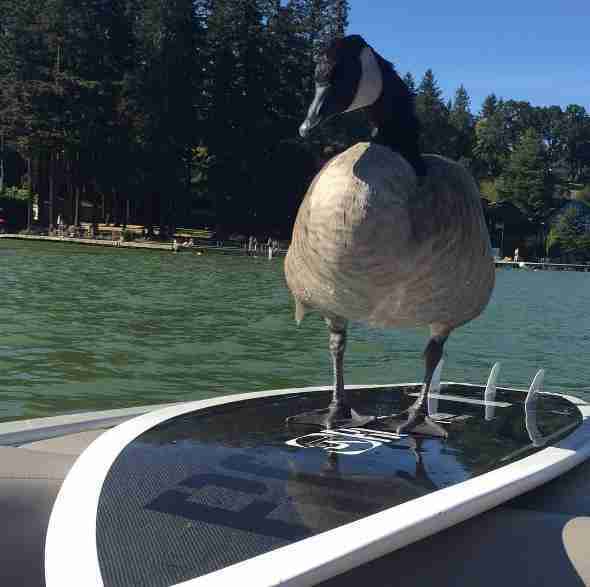 She goes out to fly around the lake every day — but always comes home. 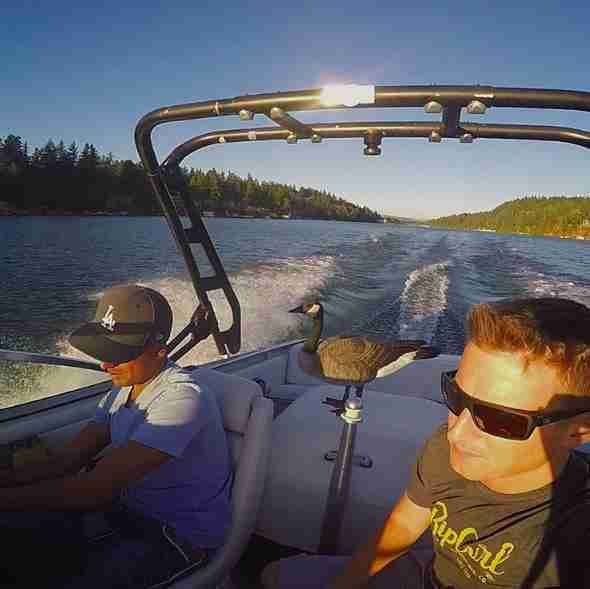 In 2014, Mike Jivanjee and his friends were out boating on a lake when they spotted something bobbing in the water. 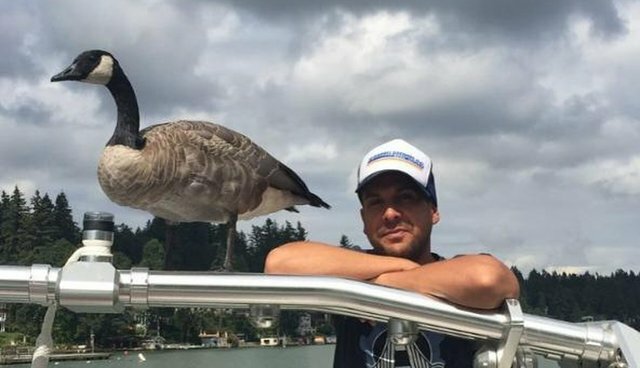 As they got closer, they realized it was a tiny goose, all alone and drowning. Wanting to help, the group scooped the little goose up into their boat and drove her over to a nearby island where her family was. 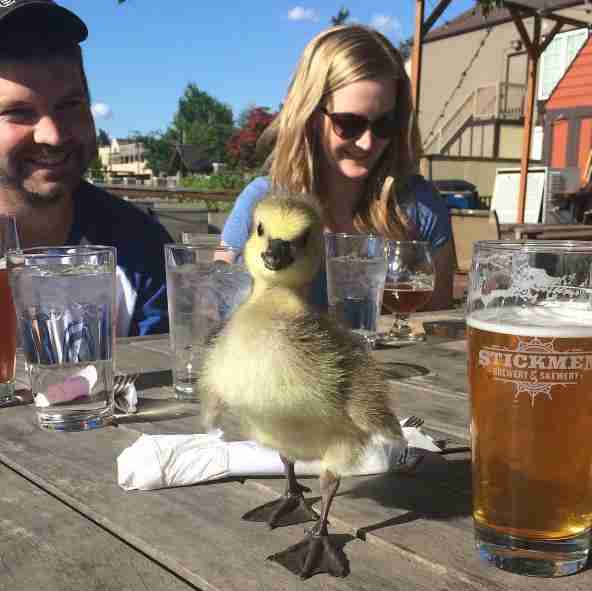 They assumed the little goose would be welcomed back into her family graciously - but something was wrong. 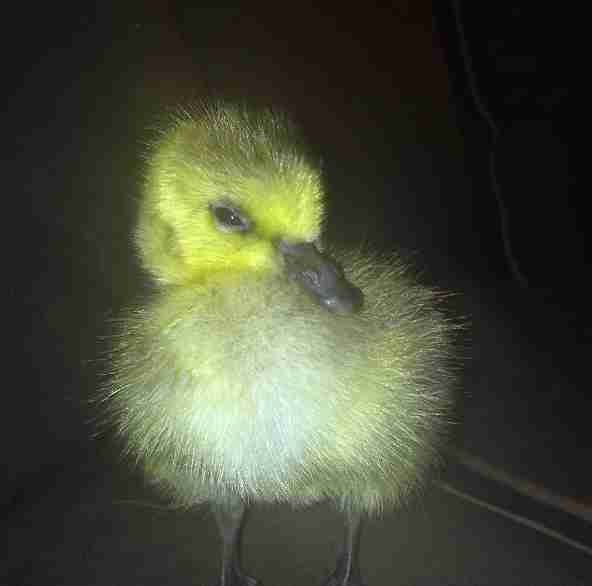 The little goose had a bad foot, and because of that, her family seemed to think she wouldn't survive. They abandoned her, and refused to welcome her back. The group wasn't sure what to do, but after watching the little goose for a bit, they knew they couldn't just leave her behind. And so Jivanjee brought her home and welcomed her into his family instead. He named her Kyle (they thought she was a boy at first), and immediately fell in love. Jivanjee raised Kyle until she was old enough to fly, and then he figured she would go back into the wild. But Kyle had other plans. Every time Jivanjee tried to release Kyle, she always came right back home. "When I saved Kyle I thought when she was big enough to fly she would fly away," Jivanjee told The Dodo. "Once she started flying she would always return at the end of the day. At about a year of age I drove her in my car about five miles away and released her. 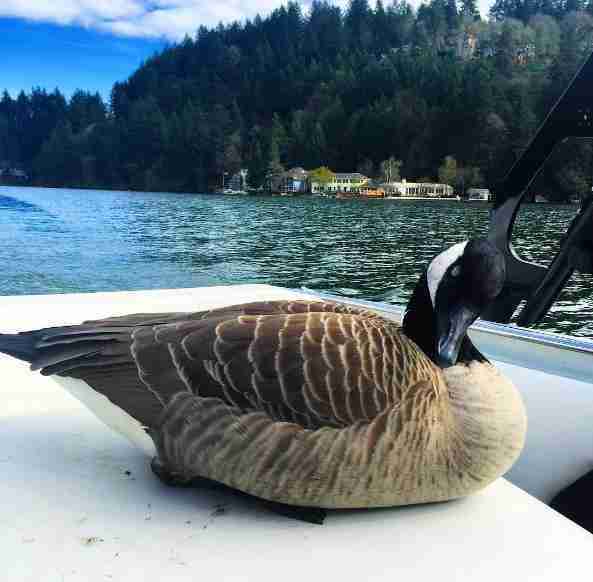 When I got back home she was already there hanging out on the boat." Now, Kyle will leave home to go out and fly around the lake, but at the end of the day, she always comes home again. She loves Jivanjee too much to ever truly leave him. 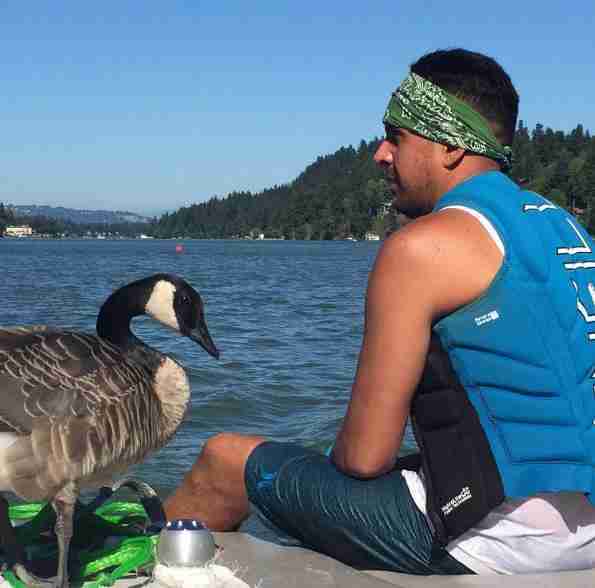 "When I am out on the lake she finds me every time," Jivanjee said. "There's no escaping her. 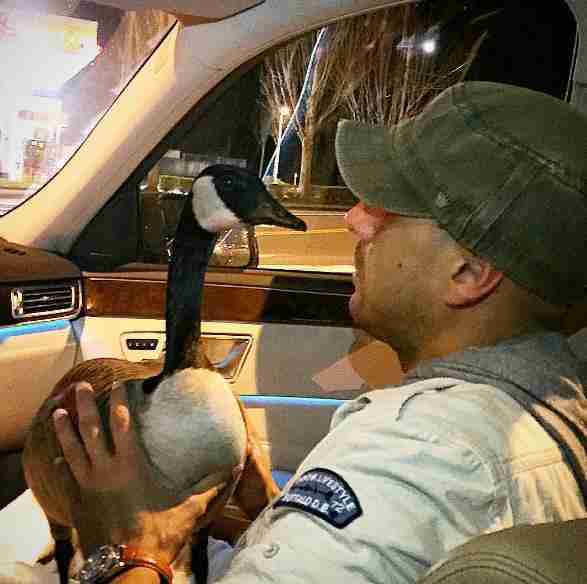 Turns out geese have, like, built-in GPS that's better than your iPhone." Kyle and Jivanjee are the best of friends and love hanging out together. The pair loves taking trips to Starbucks, hanging out with friends, going paddle boarding and of course, just chilling around the house watching TV together. 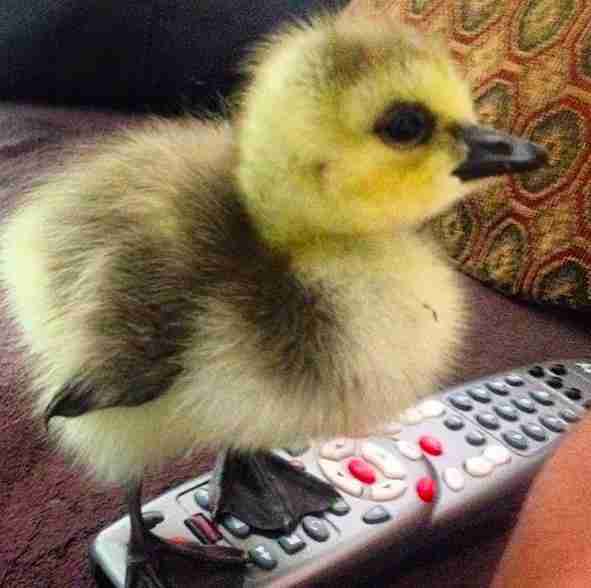 "Kyle loves all shows on the Discovery Channel," Jivanjee said. "She loves Alaskan Bush People but wants to fight all the people on Duck Dynasty. 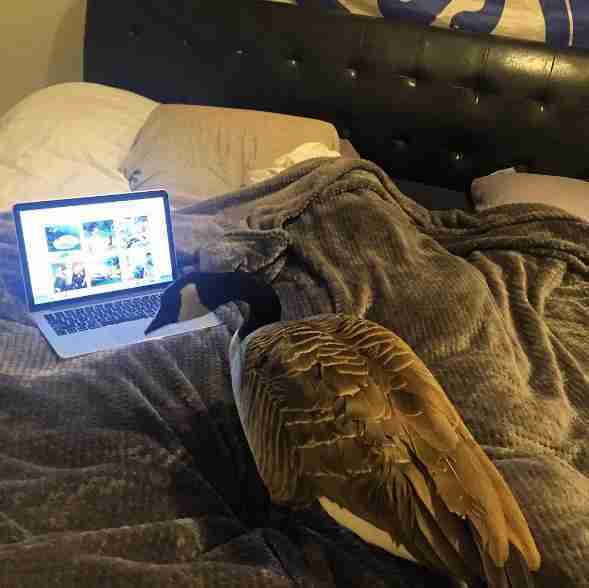 She's also is a huge fan of the Ellen Show and Animal Planet." Kyle also loves causing mischief, like hanging out inside of neighbors' houses when they go on vacation, but Jivanjee doesn't join her in those activities. "She loves to steal small items and throw them in the lake," Jivanjee said. "Keys, wallets, flip flops are all fair play." When Jivanjee rescued Kyle, he thought he would raise her until she was ready to leave. He had no idea that when he pulled her out of the water that day, he'd made a best friend for life. You can follow all of Kyle's adventures on her Instagram account.